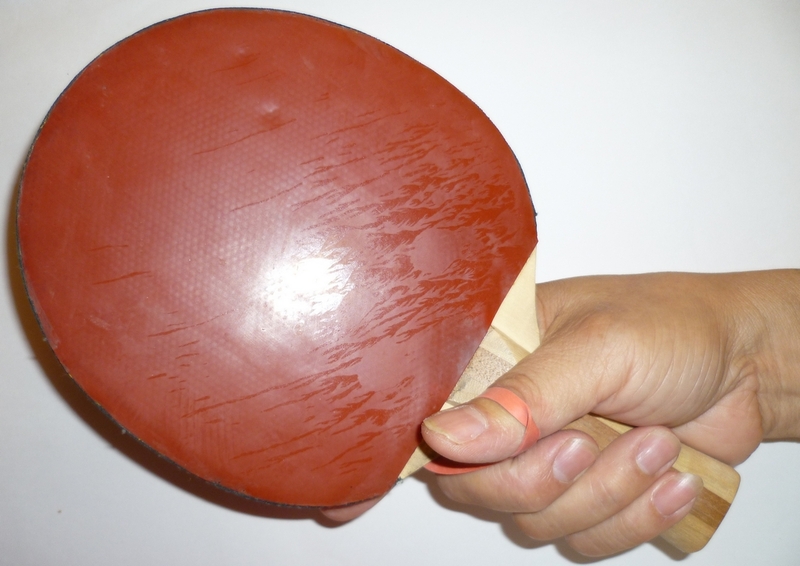 I use shake-hand grip and during play, my index finger tends to creep up towards the center of the paddle. 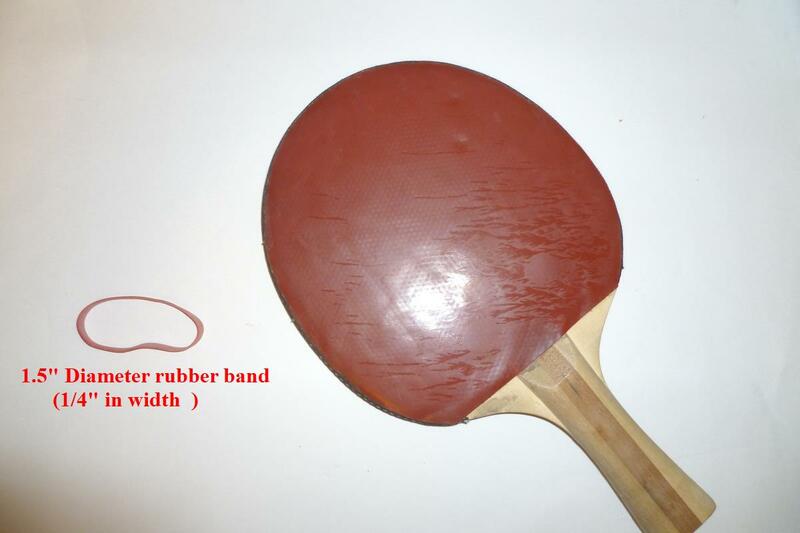 Due to this issue, the ball may sometime hit the index finger when I execute the backhand loop . Apart from the rubber band solution ( which I tried and found unsuitable for my style), is there any other effective solution for this common problem ? 2 If no coach, use a robot. setup a drill to play BH then FH, BH then FH. Do this for weeks if necessary to get your subconcious to take over the grip change between FH and BH. Like everything, it simply comes down to long hours of practice. Thanks for your kind recommendation . I just came across a simple scheme to solve this index finger business on the Internet . 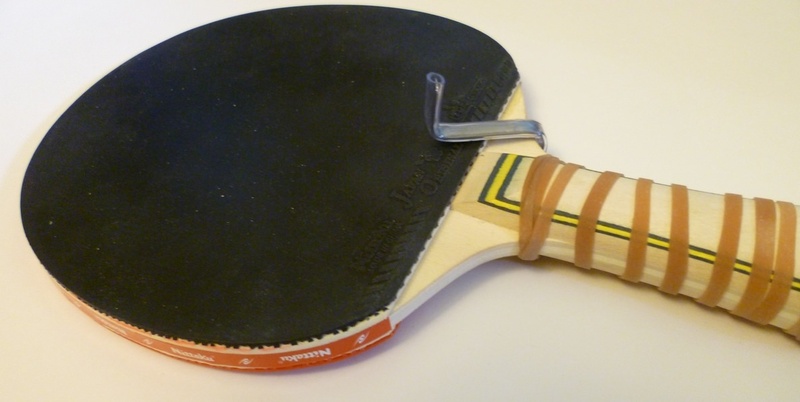 This chap came up with a clip-on device to the blade to block the index finger ! (ref: http://ooakforum.com/viewtopic.php?f=9&t=31642). As a beginner player, I have no coach and no access to a robot . So I have nothing to lose but to go for it : yesterday , I tried to make the clip-on device myself as it looked quite straight forward . 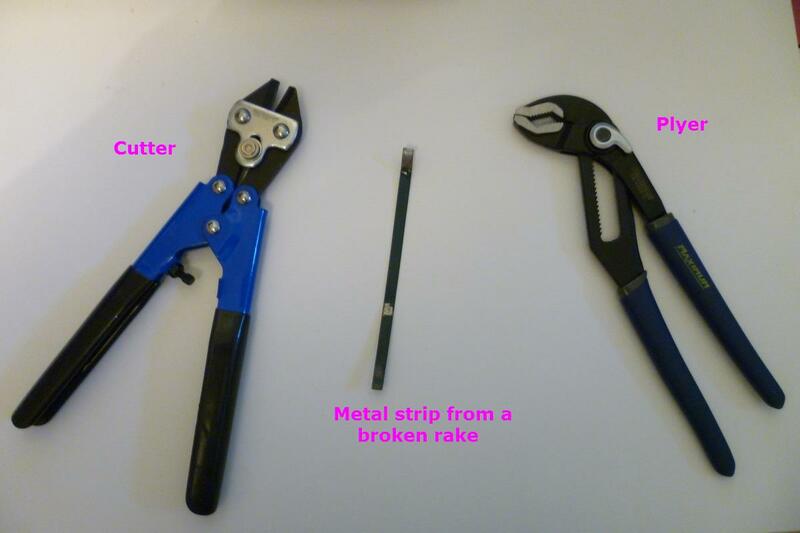 I took a piece of metal strip from a broken rake lying around in my backyard (see Pic_01) , cut it down to 3 inch. 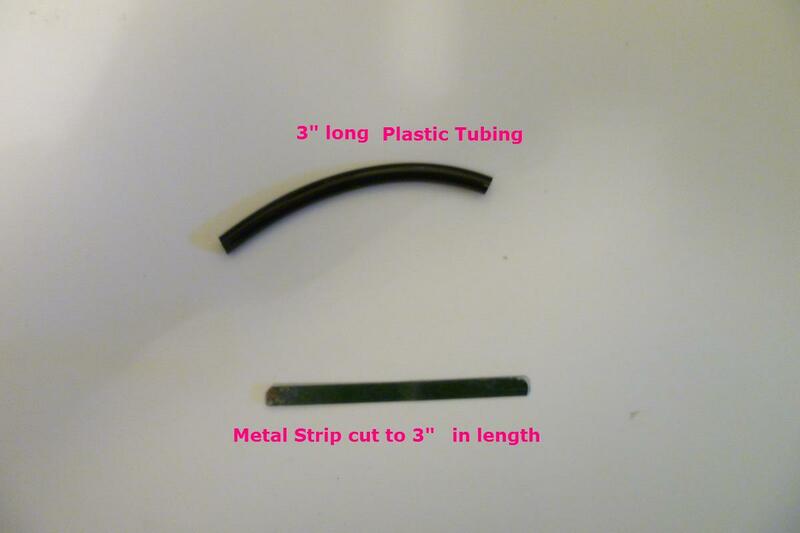 long (see Pic_02) , slipped it into a piece of left-over aquarium plastic tubing and bent it to the desired shape (see Pic_03). The final product was shown in Pic_04, Pic_05 & Pic_06 . It only took me about 10 minutes from start to finish to make this ingenious clip-on finger guard . I tried it out for an hour this afternoon . It took a while to get used to . But there is no question, this simple solution works a lot better for me than using the rubber band method . I am pretty sure it won’t take me 2 months to accustom my index finger to this great blocker ! Hey.. Thanks tommyngo for this wonderful design !! In my estimation, L usually varies from 1 1/4 inch. 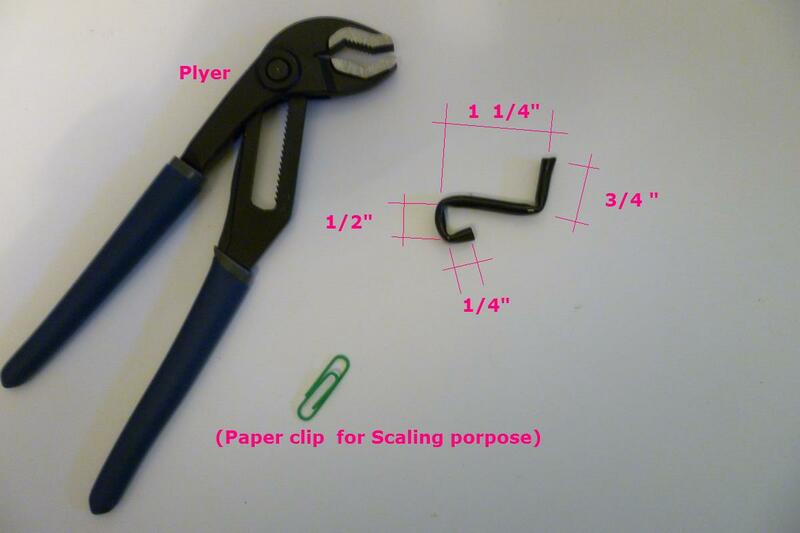 to 1 1/2 inch, depending on the comfortable position of your index finger and its size . 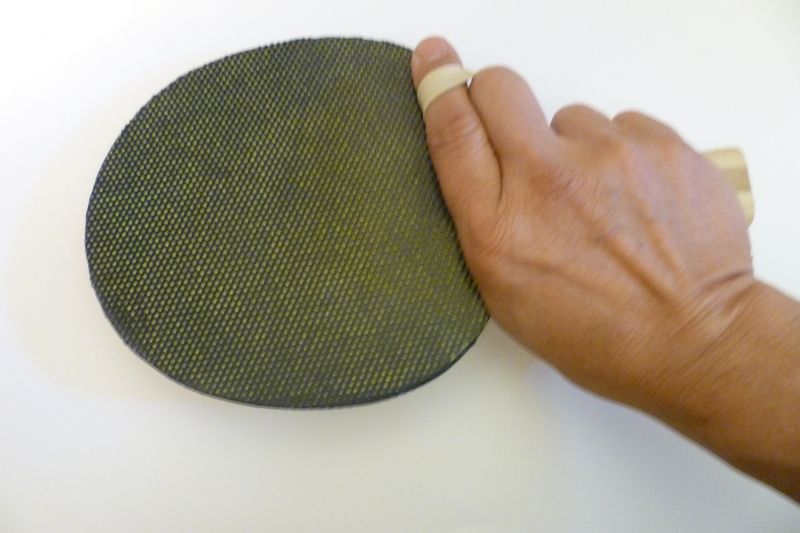 If you ever try my version of this finger guard, I would love to hear your feedbacks . Thanks. Love the device, very clever. I'm not familiar how a rubber band may be used. Can you post a picture of that? Reminds me when I was younger (and in better shape) I sometimes would practice with my warm up pants pulled down over my ankles - this is my invention. It forces one to maintain a wide stance and move both feet in unison for side to side movement. The rubber band method has countless variations. 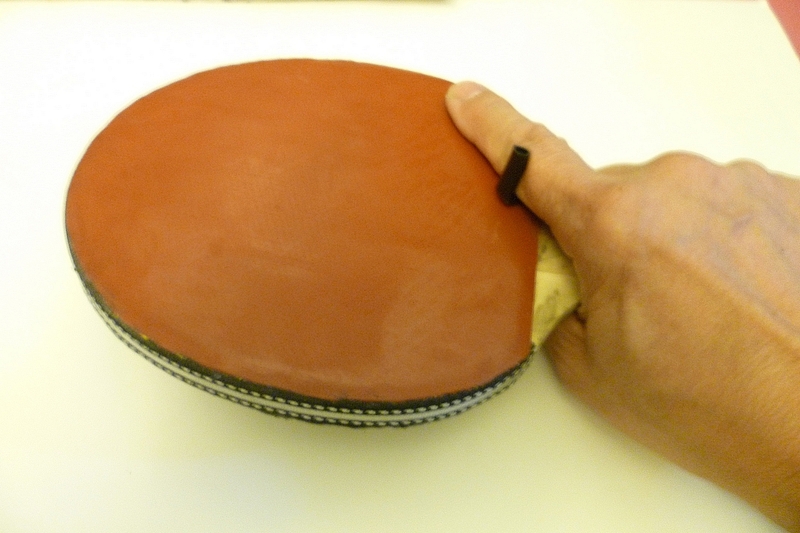 Basically, the player ties up his index finger in such a way to immobilize it and feels most comfortable with the arrangement . In my case, I tried several configurations with many different type of rubber bands ( i.e. sizes & elasticity etc...) . I finally used a 1/4'' wide rubber band with 2.5" diameter . I folded it up then slipped it onto both my index finger and middle finger ( see Pic_12) . That's it . 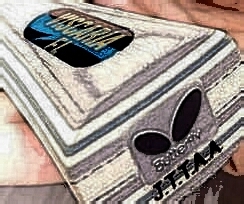 Pic_13 shows how it looks when I grip the paddle in handshake style . 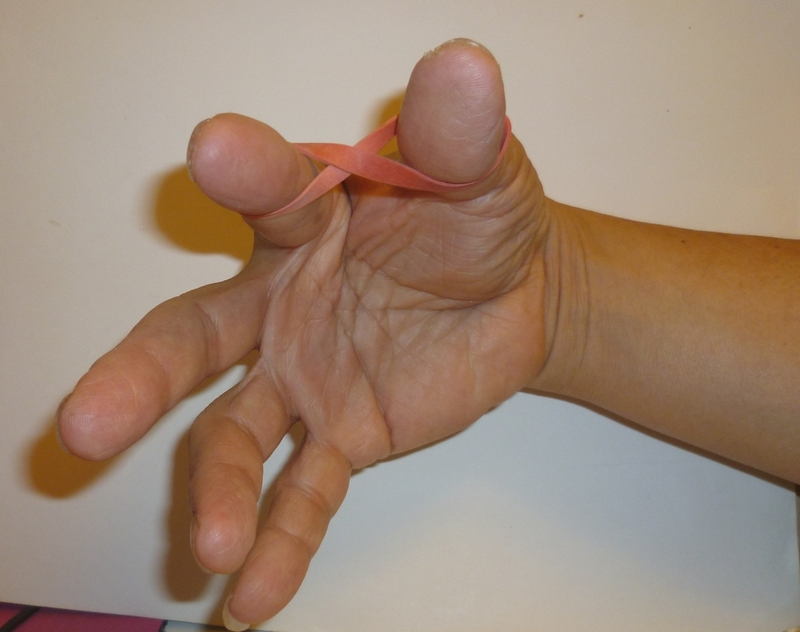 I am sure lots of players have used this method with their own ways to tie up their index fingers . If you are not pulling my leg then it must have been a hilarious sight !! BTW, you can still do it now with a giant rubber band 12" diameter rather than the warm-up pants . 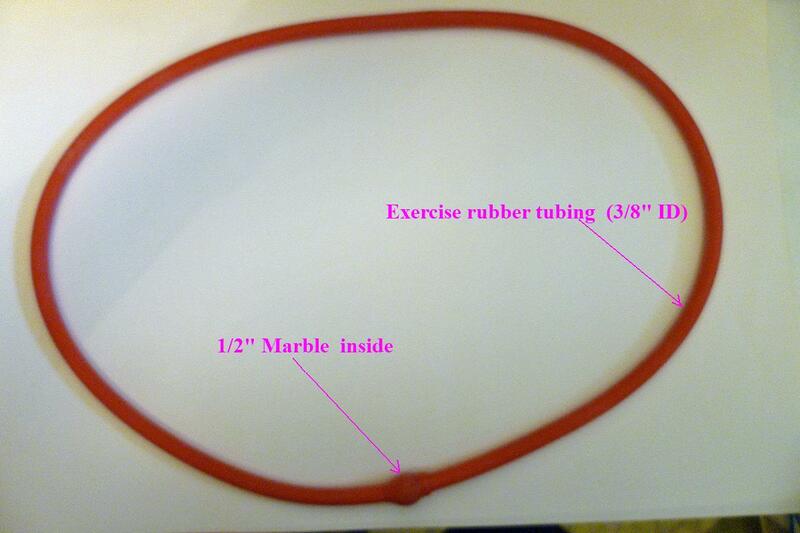 Take a 40" long exercise rubber tubing ( about 3/8'' ID ) . Slip a 1/2" diameter marble about half an inch into one end of the tubing . Then insert this end into the other end so that the marble is 1/2" trapped inside . Voilà ..You have a 12" diameter giant rubber band ! 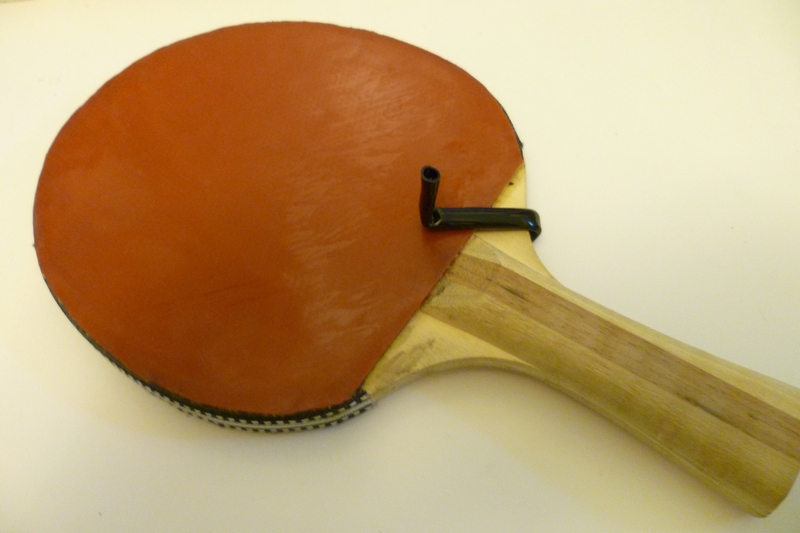 Each to their own but personally I want my warm-up pants around my waist and my index finger allowed to move up and down the backhand side of my paddle. 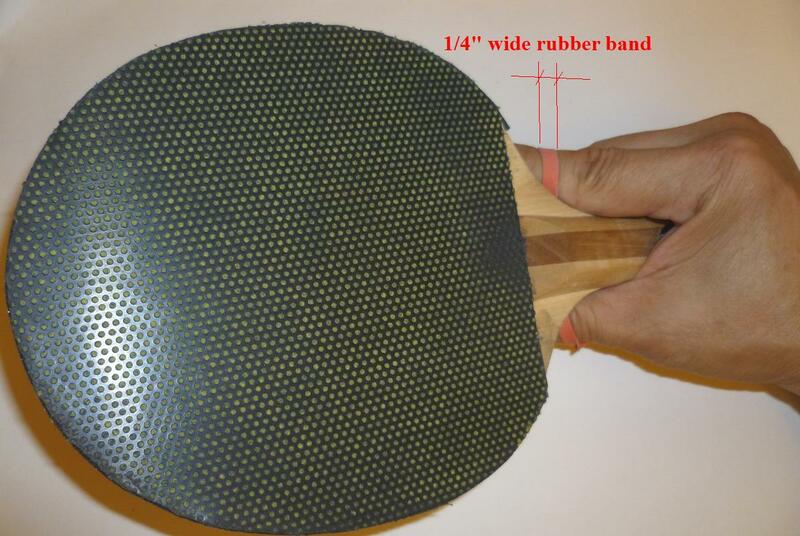 In this way the rubber itself becomes the blocker !! 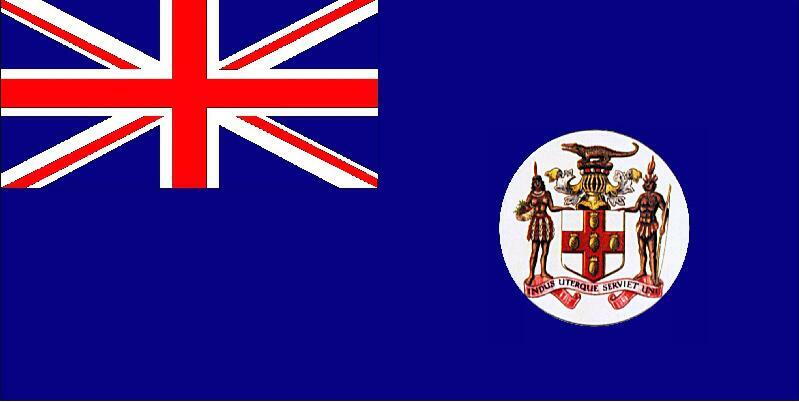 (see Pic_14) . He suggested D could vary from 1/2" to 3/4". I thought this is brilliant ! 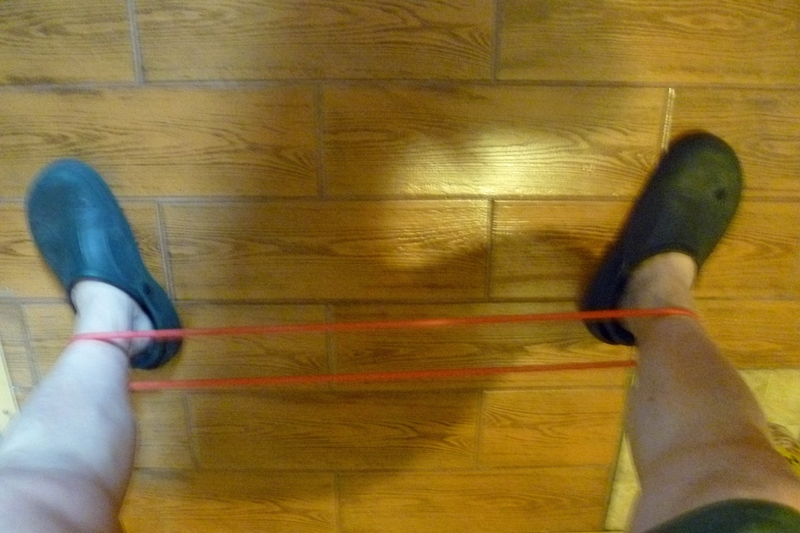 Here are 2 photos illustrating the 12" diamter rubber band that can replace your warm-up pants . I agreed with Simon_plays 100 % : the warm-up pants should be kept around the waist at all time !! But your idea is really unique .. 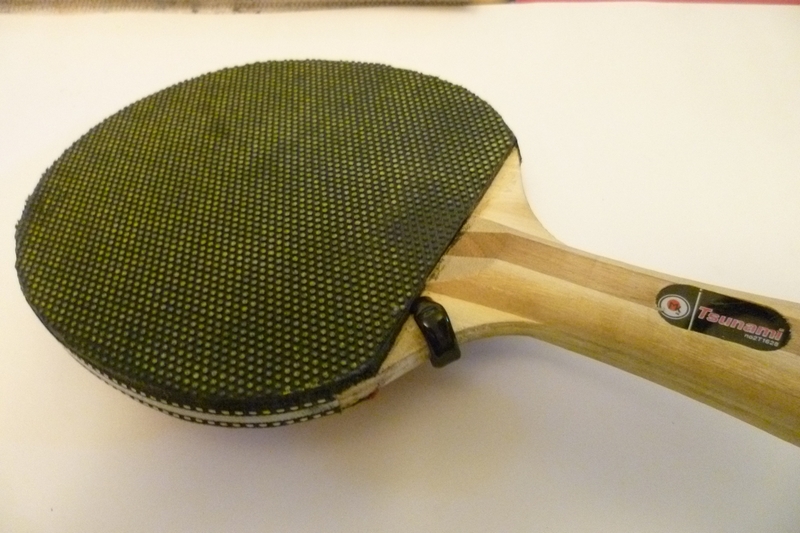 Since this thread seems to be about extravagant and controversial solutions to everyday table tennis problems I thought I'd add mine. Sometimes, when playing against a particularly adept opponent in the past I found that I would miss the ball with my racket by just a few inches. 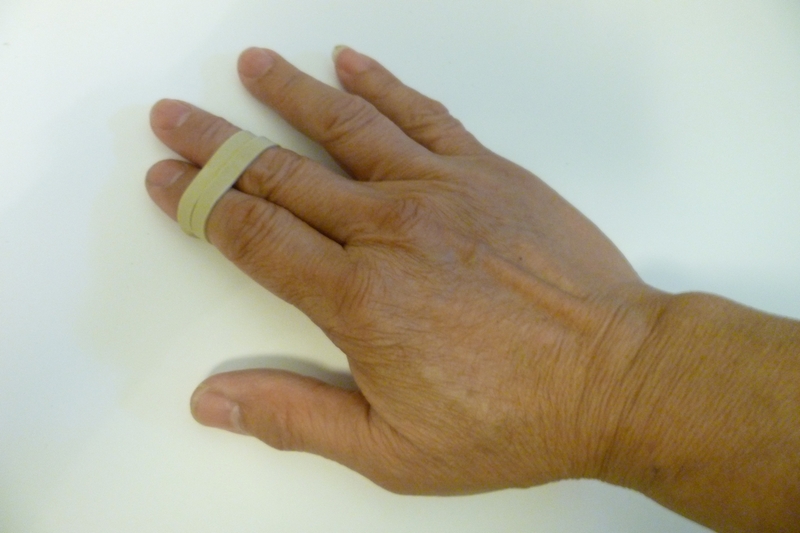 Yesterday I played with a guy using a 1/4"rubber band wrapped around his index finger and the thumb . I tried his method , not bad but it is a new configuration for me . I thought you might like to see it, too. 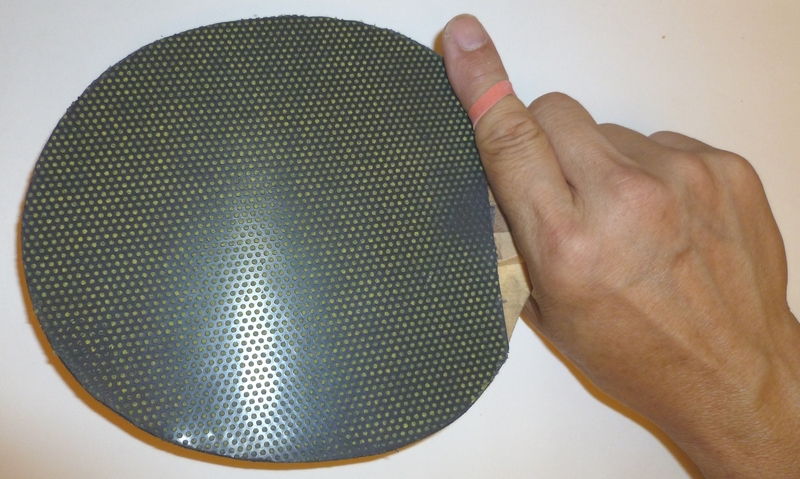 Someone asked where I got the material for the finger guard . This is the kind of drake I got the metal strip from . Your rubbers seem to be illegal as hell. 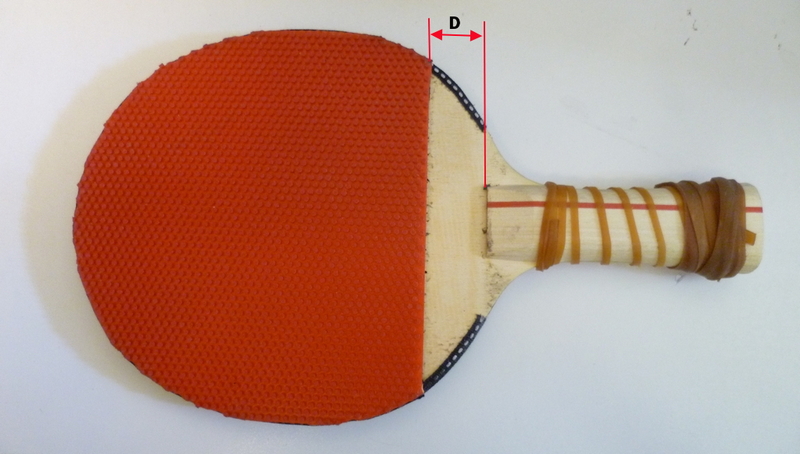 No ITTF markings (or any for that matter), and what's the deal with tops of the pips? You are 100% correct ! 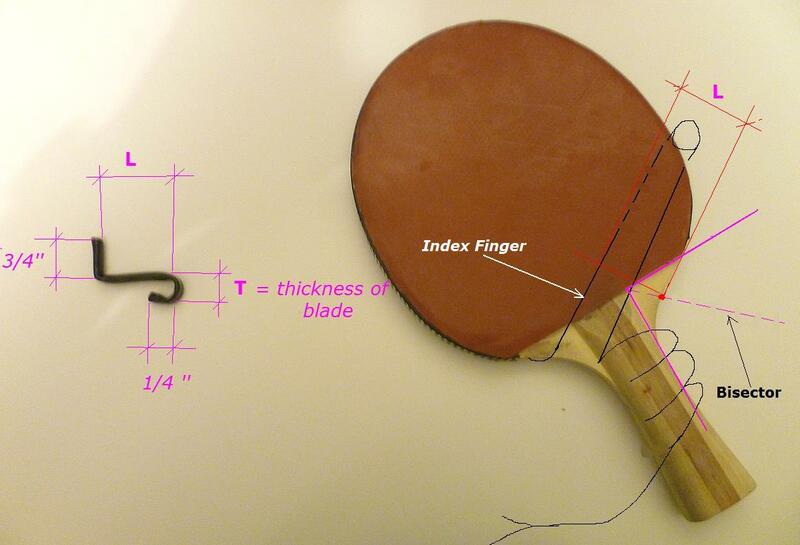 I am play with ITTF complied paddles for sure . Got it! Looking forward to the 'wheel' thread - I was curious about that gizmo for quite some time.